Aoife* has a wide range of advocacy experience, which spans from acting for multinational corporations in urgent injunctive matters to individuals in pro bono cases. Aoife has particular experience acting on urgent matters in front of courts and arbitral tribunals. She is known for her ability to jump head-first into a situation and effectively deliver results for her clients. While Aoife acts quickly, she always thinks§ first, looking at a situation from every angle and offering creative solutions. Aoife draws on her strong academic background when approaching a new problem, critically‡ , analyzing the facts and the law, and refusing to take no for an answer. .
University of Toronto – Trinity College (2012) HBA (Political Science, Canadian Studies and History with High Distinction). Aoife's practice encompasses a broad range of civil litigation, with particular experience acting for clients on urgent matters, including motions for injunctive relief. 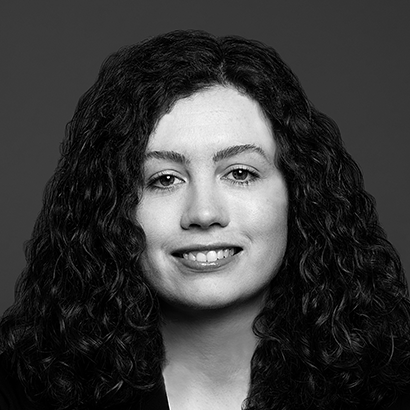 Prior to joining the firm, Aoife articled and practiced as a litigator at an international law firm where she worked on a wide variety of civil litigation matters including commercial disputes, real estate disputes, and construction lien matters. She has represented clients before the Ontario Superior Court, administrative tribunals, and in both domestic and international arbitrations. Aoife obtained her law degree from the University of Toronto and completed a semester abroad at the University of Birmingham (UK). At the University of Toronto, Aoife was an active participant in the mooting program, receiving an award for top factum at the 2014 Wilson Moot, and coaching the winning team in 2015. Canada’s leading litigation firm continues to attract top legal talent, with the addition of three exceptional new associates. The Presumption of Resulting Trust and Beneficiary Designations: What's Intention Got to Do with It? Aoife Quinn co-wrote the paper “Presumption of Resulting Trust and Beneficiary Designations: What's Intention Got to Do with It?” for the Alberta Law Review on May 17, 2016.